There’s more to the pergola than meets the eye. As a homeowner, you don’t necessarily need to know exactly how or why a pergola makes such a visual impact. If you have a pergola as part of your Fort Wayne, IN, outdoor living space, it’s alright if you take it for granted. If you don’t yet have a pergola, it’s time you considered adding one of these graceful servants to your deck, patio or outdoor kitchen. 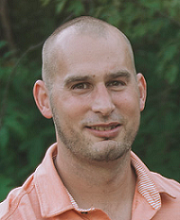 Custom pergola builder Archadeck of Fort Wayne is your resource for designing and building your pergola whether your tastes are traditional or more innovative. 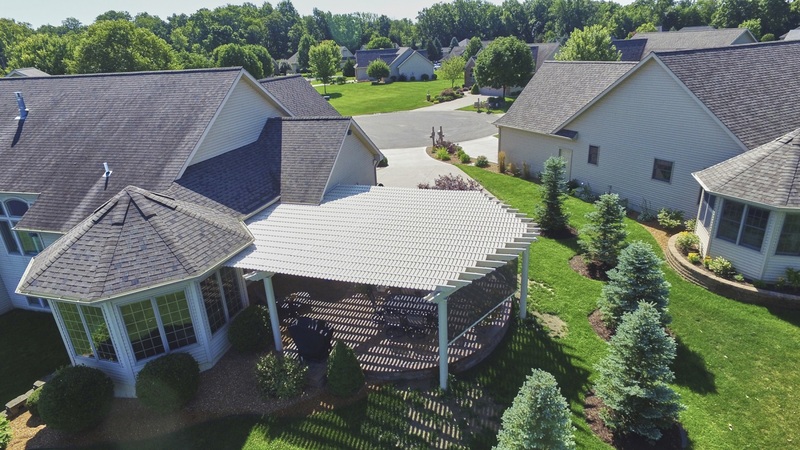 Homeowners in Ashley, Fremont, Hamilton and Auburn, IN, appreciate their pergolas for the shade they provide. And yet, some pergolas don’t provide as much shade as you would expect. They also appreciate the ornamental qualities of pergolas. To many, the pergola’s shade is secondary. Fort Wayne area homeowners have found that a pergola is a perfect place to hang a ceiling fan and stir an Indiana breeze when Mother Nature forgets to provide one. They appreciate shade as much as the next person, and they appreciate a breeze even more. In addition to installing a fan in your pergola, you can have a pergola wired for light fixtures to add a romantic flair at night. Are You Seeking Shade or More Shade? Posts, beams, rafters and slats are the components of a basic pergola. From a distance, the top of a pergola may look like a canopy. When you examine the uppermost portion of a pergola, and you see its rafters and slats, you see the amount of empty space up there. That space – between the rafters running in one direction and between the slats running perpendicular to the rafters – holds the secret to how much shade your pergola will cast. Also affecting how much shade your pergola will provide is the orientation of the pergola in relation to the sun’s path. We’ve all seen how the shadow of a beach umbrella changes position as the sun travels overhead. Likewise the pergola’s shadow moves across your deck or patio. When the sun is directly overhead, you will have the least amount of shade at that time of day. Closer to sunrise or sunset, your pergola will cast a longer shadow, but the shadow will still have “holes” in it unless your pergola is covered. When Archadeck of Fort Wayne talks with you about your pergola design, we’ll ask now much shade you expect the pergola to provide. We can increase its shade by using thicker rafters and slats. We can also add a cover over the pergola to maximize shade. 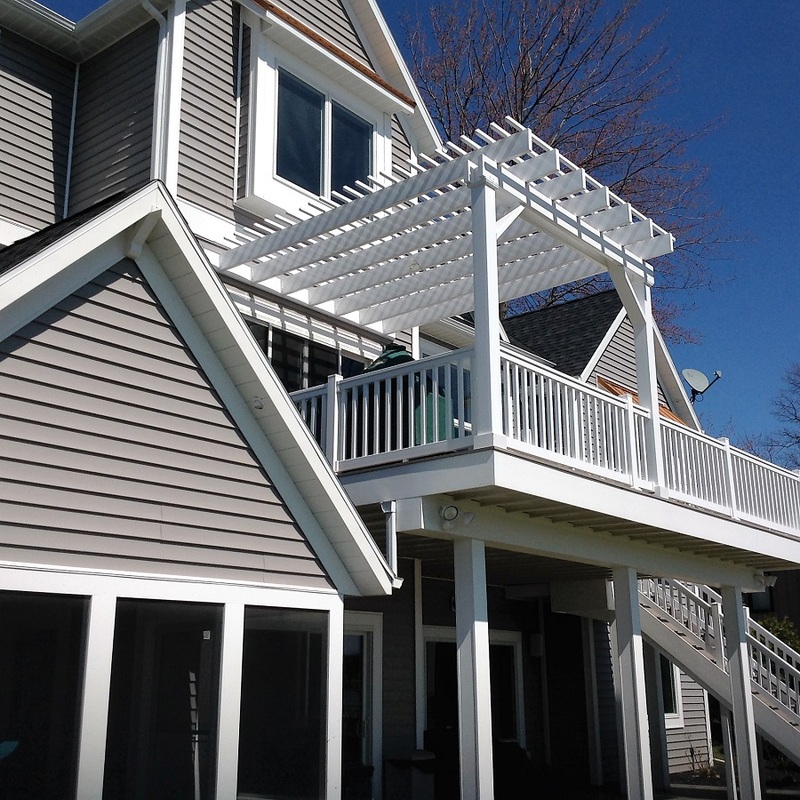 — Archadeck of Fort Wayne custom pergola with retractable, vertical sunscreen. 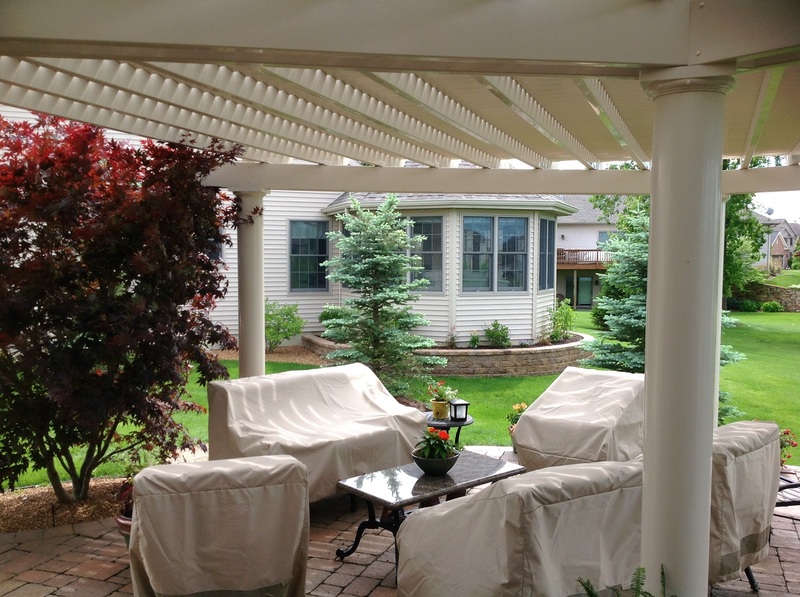 The idea of a pergola cover introduces several design possibilities. 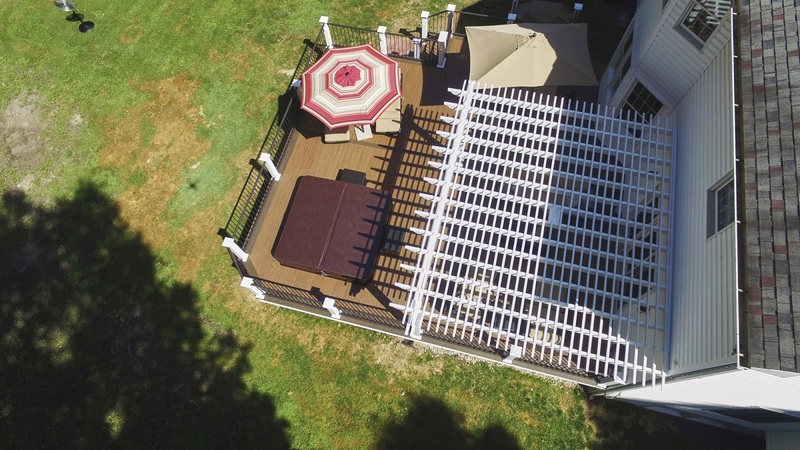 A retractable canopy, or a shade cloth that filters some percentage of the sun’s UV rays, or polycarbonate sheeting – these are three types of popular pergola covers. In addition to providing more shade, a pergola cover can introduce another color to the scene. While pergolas are naturally decorative, when you add a brightly-colored cover they make even more of an impact. Traditionally, pergolas have been constructed of wood, but vinyl, PVC and even aluminum are other materials you can select for your pergola. If you prefer wood, you might want to consider cedar instead of pressure-treated pine. 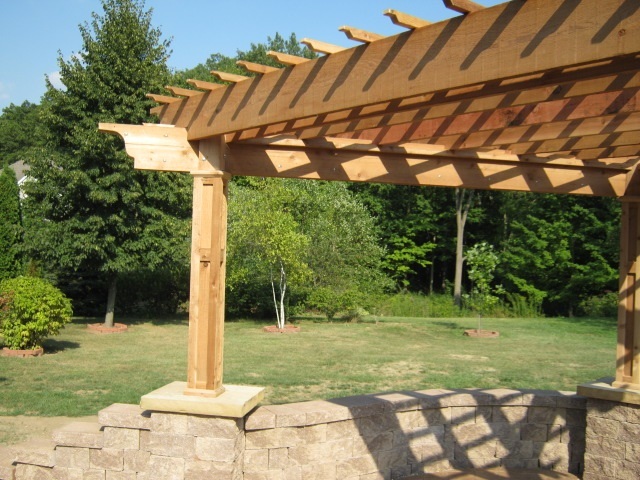 The beauty of cedar, especially when stained, adds a richness to a pergola that can make it the center of attention. 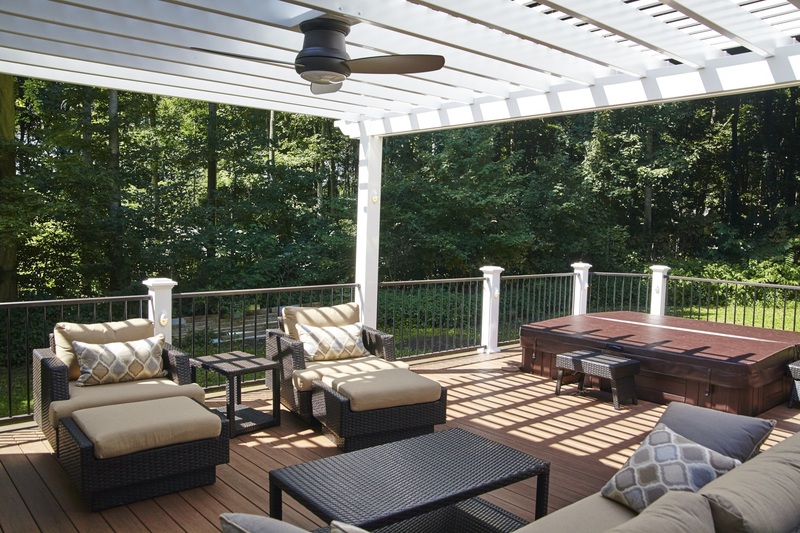 Like a wooden deck, a wooden pergola is affected by weather over time. The sun’s rays break down wood fibers and cause them to turn gray. If you prefer low-maintenance materials that don’t need to be painted or stained every year or two, we suggest you consider a pergola made with PVC or vinyl. Aluminum is also a possibility, and it comes in a variety of colors. 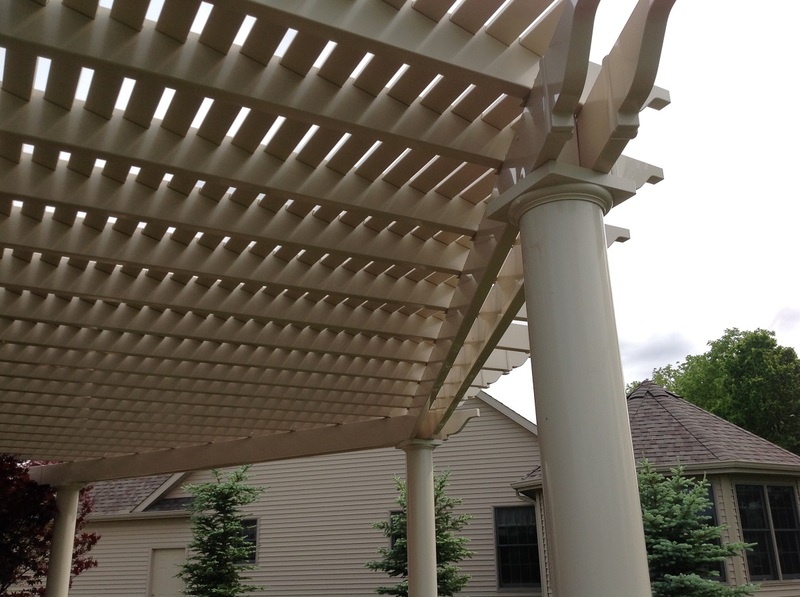 Archadeck of Fort Wayne can help you select the pergola material that will best satisfy your requirements. The first thing we notice about pergolas, whether we realize it or not, is that the pergola is a vertical structure in a horizontal setting – usually a deck or patio. That contrast alone accounts for much of its visual interest. A pergola helps to anchor an outdoor living space, visually, whether it covers your entire deck or patio or just a portion of it. A pergola is a powerful design element when it is placed at the edge of your outdoor space where it serves as a visual entry point or boundary. It can have a similar effect when it defines the area of an outdoor kitchen. Many pergola designs include a decorative cut at the end of each crossbeam, rafter or slat. Sometimes the end cut is called a rafter tail. Popular end cut designs have names like crescent, crescent step, champion and ogee – and there are many more. 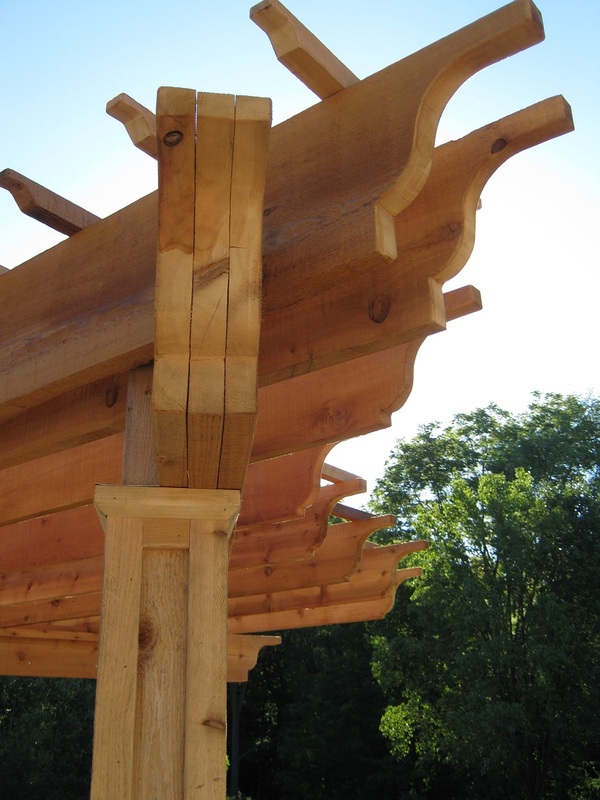 Adding an end cut design to your pergola is one way we can customize it for you. We can also build some privacy into your pergola design by adding latticework at one or both ends. Clients are most likely to choose a privacy screen when their pergola stands between them and their neighbor’s view into their deck or patio. 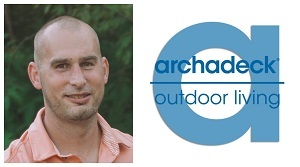 Archadeck of Fort Wayne is northeast Indiana’s premier custom pergola designer and builder. Our pergolas are designed to provide shade, decoration and an anchor for your outdoor living space. 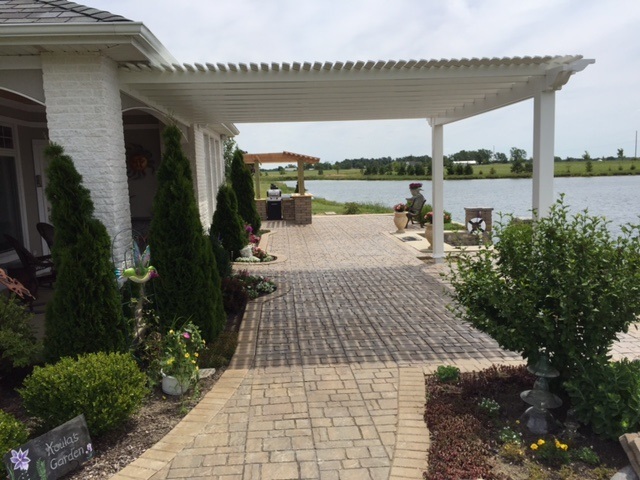 If you are interested in learning more about what a pergola can do to enhance your patio, deck or outdoor kitchen, call us today at 260-969-8663 or send us an email to get started! Visit our pergola and trellises photo gallery to see more of our beautiful pergolas built by Archadeck of Fort Wayne!